Should police officers behave differently with autistic suspects? Two recent commentaries support the changes I suggested in my written evidence to the Home Affairs Committee. Police find interviewing and interacting with witnesses and suspects with autism a real challenge, a study has revealed - highlighting that the ways officers have been taught to interview are at odds with what is needed in these situations. Existing interview techniques tend to focus on open questions, only later narrowing down to closed questions, but research shows that people with autism may need focused questions from the outset. 10. As I was innocent and did not know any better at the time, I made the mistake to refuse to call a solicitor. During the police interview, one question particularly bothered me. The interviewing officer after asking me questions about my laptop such as 'has it got anything on there about public underground?' and 'has it got anything on there about plans for any terrorism act? ', asked 'has it got anything on there that might be construed as causing a public nuisance?'. The correct answer would have been 'yes' as I have a word processor, an email client, etc that could all be useful to a terrorist and most likely can be construed to be of use for anything including causing a public nuisance. However, I also realised that answering the positive would not be helpful to me and challenged the question when the investigating officer just wanted answers. 12. An essential recommendation would be for all front-line police officers to receive some training about the autism spectrum. This training ideally would involve those on the autism spectrum. I understand that a few police officers have had sessions with the Asperger London Area Group (ALAG). This training should be made more generally available. 13. At the very least, front-line officers should read the ACPO-endorsed Autism: a guide for criminal justice professionals publication of the National Autistic Society. 14. With such training it is hoped that police officers realise that a behaviour different from that of a neurotypical is just different rather than suspicious; consider hyper- and hypo-sensitivities that the public they interact with may have; and use clearer interviewing questions. I moved to London from Paris twenty-one years ago. I have studied computer science and criminology, and worked as a software developer, a technologist and a journalist. I am autistic and have been described as ‘calm, almost too calm’. Before the web had been invented. A lot of my early repairs were telecoms related: RS232 cables, modems and phones, and computers as well. To empower others to regain control of their devices. For more than thirty years I’ve been demystifying new technologies and software development, initially, and how to reclaim our civil liberties, later. The collaborative repairing going on at Restart Parties are occasions to demystify repair and to empower participants to fix their electronic and electrical devices. It is for this transformative process, when people realise that many repairs are accessible to them, that I am involved with the Restart Project. The variety is interesting, but what is most gratifying is when someone arrives hoping for a free fix and leaves having fixed their device mostly on their own. It is the process of discovery, when they realise that they are already knowledgeable: that if they have changed a fuse they likely understand the need for electric continuity; that if they have ever touched a lit lightbulb they likely realise that electric devices get hot. Fixing their device is a small step from that knowledge: when a device stops working, first steps are to check that everything is still connected, that electricity flows, and that there’s no dust or crumbs blocking any fan so the heat is not trapped inside. The next realisation is that some simple tips go a long way: how not to end up with a pile of screws, use a pill box or an egg carton to store them so it’s easy to find which screws are used at which step when time comes to reassemble things. The skills needed for such repairs are a lot of common sense, some limited experience (learnt in the process), good research skills and access to a few tools. Learn, research, occasionally write. Check on the welfare of the detained persons by making unannounced visits to the custody suite of police stations. Write (too many) Freedom of Information requests. Walk. Injustice. Noise. Surveillance. Crowds. Deaths in custody. Cars. Waste. Restart Parties, Qi Gong, police custody visits, mornings of mindfulness, conferences. Though mornings are difficult and best avoided. In this weather, a hat. Bootnote: Read an earlier post about my experience of becoming a restarter. 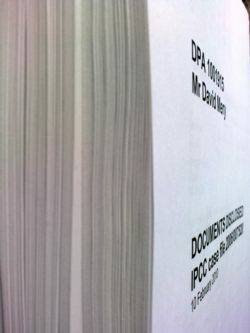 IPCC case file eventually destroyed. Possibly. Probably. After my unlawful arrest in July 2005, I complained to the Independent Police Complaint Commission (IPCC) and then appealed the outcome of the supervised investigation. After deciding not to uphold my appeal, the Independent Police Complaint Commission (IPCC) closed my case file seven years ago. On 2014-06-19, the seventh anniversary of its final correspondence about my appeal, the IPCC was due to delete the electronic content of my case file and destroy its paper content. Unfortunately, it is not possible for you to witness either the destruction of the hard copy file or deletion of the electronic file but we will send you confirmation of their destruction once this has been done. I am pleased to confirm that the documents held in the electronic file of your case were deleted yesterday morning. I confirm that four paper files were also destroyed at the same time. I attach a spreadsheet detailing the electronic documents that were deleted. I am unable to list the contents of the paper files as we do not maintain an index of each paper document destroyed, only the fact that the file has been destroyed. Included in the spreadsheet is reference to the destruction of the 4 paper files. The attached spreadsheet listed the creation date, record number, title and container title (the case reference number) of 32 electronic documents that had just been deleted and the box numbers of the four paper files that had been destroyed. In 2006 the use of a Electronic Document Records Management System (EDRMS) was in its infancy at the IPCC. At this time the majority of information was filed in paper files. Your case was allocated a case number 2006/007520 and documents for your case, whether in electronic or hard copy format, were filed against this number. The whereabouts of paper files were also recorded onto the EDRMS. Electronic documents were either scanned or saved directly to the case file and dated with the date that they were added to the system, not the date of the document. As an example of this, the document cited in your email "Final Report Minute - Supervised Investigation' from the Casework Manager to the Commissioner dated 23/11/2006," is shown on line 18 in the spreadsheet as FR minute and dated 4 December 2006. There were four paper files allocated to your case file number, these were files of some substance I am unable to say what documents were contained in the files as they have now been destroyed. Following receipt of your email, I have carried out a search on the EDRMS which reveals that there are no electronic or paper files still in existence for this case. Although all documentation is filed to the appropriate case file, in order to allay your concern that some documents have been inadvertently retained, I have spoken to the casework manager who had conduct of your case and to the commission secretariat to ensure that they have no documents relating to your case in their possession. In both cases they confirmed that they do not have any documents. I am therefore able to confirm that all documents relating to your case have been destroyed in accordance with our retention policy. I did carry out some searches using variances of both your name and the case number. These were done both on my initial search and the further search carried out last week. It would have been easier to allow me to witness the deletions and destructions as initially requested. The Metropolitan Police Service should delete their litigation and investigation files on 2015-09-02, six years after their last correspondence: their apology. This second supplementary submission provides further information about the use of Tasers by and tactics of the the Metropolitan Police Service (MPS) when they were deployed on the night of 2012-10-01 at the River House mental secure unit, part of the Bethlem Royal Hospital run by the South London and Maudsley (SLaM) NHS Foundation Trust. As mentioned in paragraphs 17 of my evidence1 I have an ongoing complaint with the Information Commissioner’s Office about the cover up of the MPS concerning incidents at the River House mental secure unit. As part of their response to this complaint, the MPS have disclosed four Taser use forms2. The further information contained in these forms should be directly relevant to this inquiry. The forms confirm that four Tasers were ‘Drawn’ and reveal that 12 ‘TASER officers [were] present’. The text of the four forms is very close but with some differences. So much wording is identical that it is obvious the four officers conferred before filling in these forms, which may well be the standard procedure. However, some differences are significant. It appears that part of the intelligence that informed police decisions was faulty. One form’s ‘Information/Intelligence’ box includes: ‘Reports were also received that someone had been stabbed to death within the unit and that a further person had also been stabbed.’ while the three others state: ‘Reports were also received that someone had been stabbed within the unit’. Nowhere in the fully unredacted summary report3 is there any mention of a stabbing and the extensively redacted full report4 only includes one mention on p. 25: ‘One report by xxxx refers to “support to stabbing incident”. This is probably based on one of several hoax calls made by xxxxxxx.’ The police based its decision on how to intervene in a mental health ward in part on intelligence which was a hoax (not even considered worthy of mention in the summary independent investigation report), with one officer believing there had been two stabbings resulting in one death and three other officers believing there had been one stabbing and no consequent death, when there had been no stabbing at all. While the tactical options considered included ‘Negotiators’, ‘Prison training tactics’, ‘Taser’ and ‘Entry to save life and limb’, the one adopted was ‘Officers used prison training tactics and cleared the unit with the use of taser. Each of the bedrooms/rooms were cleared and all patients were eventually contained in the lounge area. The staff were removed from the secure room they were in and the aggressive ring leaders [also described as ‘main trouble makers’ in other forms] were removed from the group of patients into a separate secure location.’ The forms do not mention any consideration to the potential additional trauma to the vulnerable patients treated on this mental health ward when faced with ‘prison training tactics’ imposed by TSG officers, twelve of them equipped with Tasers and four of them having their Tasers drawn. At a meeting of Lambeth's Health and Adult Services Scrutiny Sub-Committee5, representatives from SLaM stated ‘The police had been called for support but the incident had been managed well by staff at SLaM and the police did not get involved in the incident’. The investigation report already contradicted this statement, but now we learn that SLaM was attempting to cover up ‘prison training tactics’ used by the police. In light of these Taser forms, it would be useful for this inquiry to look into what intelligence the police use when deployed to mental health settings, how they check this intelligence with medical staff, the suitability of the tactics considered and used, and whether there should be support for patients following a police deployment. (c) overall number, age, ethnicity and whether patient/staff/other of those police tactics are used against. As mentioned in paragraphs 17 of my evidence I have an ongoing complaint with the Information Commissioner’s Office about the cover up of the South London and Maudsley (SLaM) NHS Foundation Trust concerning incidents at the River House mental secure unit. There has been some progress in this regard which should be of interest to the Home Affairs Committee. A clear example of the further poor attempt at a cover-up can be seen on p. 31. Most of the paragraphs describing the details of 'Incident 2' are redacted, however we already know from the 12-page summary report (link in footnote 11 in my evidence), and the repeated paragraph in the executive summary (p. 3), that 'In the second incident which occurred at approximately 0250, one patient challenged staff with regard to decisions which had been taken about the management of the four patients involved in the first incident. He accused them of discrimination, believing that there had been a racist motive and that staff had assisted the police to pursue this line of action. He threatened to kill staff and one of the white perpetrators, who he declared had been treated differently to the black perpetrators. This resulted in nursing staff losing control of the ward for a second time when they retreated to the nursing station.’ These allegations of discrimination must not be redacted. Given that this report is from the largest mental health provider in the country, where two people from the UK’s African Caribbean communities have lost their lives while in the care of this provider at the hands of the Metropolitan Police services, it is particularly important that every member of the committee should be able to read a fully unredacted copy of this report. Considering the serious public safety implications, as well as public confidence concerns in policing and mental health, exemplified by such incidents, it would be helpful for this inquiry to get a full insight into both policing practice on the ground and patient experience at this mental health provider. The first part is about my experience as someone with Asperger’s syndrome of a police encounter at Southwark tube station on 2005-07-28 that resulted in an unlawful arrest. The second one is about two critical incidents that occurred at the River House facility operated by the South London and Maudsley NHS Foundation Trust on 2012-10-01. I eventually exposed that 48 Metropolitan Police Service (MPS) officers were deployed and four Tasers drawn. The third one is about the use of Mental Health Act (MHA) 1983 s136 in London and is the result of a research I did last year. I submit this written evidence as an individual having lived in London for over twenty years. On 2005-07-28 at 19:21, when trying to take the tube at Southwark tube station, Metropolitan Police Service (MPS) officers found my behaviour suspicious, stopped and searched me under s44 of the Terrorism Act 2000 and eventually arrested me for the offence of public nuisance. In May 2013 I was diagnosed as being on the autistic spectrum - of the Asperger’s type, by a clinical neuropsychologist at Homerton Hospital. I played with my mobile phone and then took a paper from inside my jacket. As can be seen from this list it is clear that my failure to interpret social cues appropriately, including avoiding eye contact with the police, which is typical autistic behaviour, triggered the stop and search and the wrongful arrest. While on the platform there were reminders to ‘keep your bags with you at all times’ and of course I interpreted these literally keeping my rucksack on my back at all times. I am hypersensitive to sound and I was made to wait for a while at the entrance of the station, before being led to the police van, while some station’s alarms were ringing. As my hands were handcuffed I could not block my ears. At the station entrance an officer removed the handcuffs and started giving me back what they had taken from my pockets. However, confusingly another officer said that was not the proper procedure and I was re-handcuffed and was told a senior officer would come to apologise and I should wait in the police van. First time the door re-opened when I was in the back of the van was not to apologise as I had just been told but instead to tell me I was arrested. As I was innocent and did not know any better at the time, I made the mistake to refuse to call a solicitor. During the police interview, one question particularly bothered me. The interviewing officer after asking me questions about my laptop such as ‘has it got anything on there about public underground?’ and ‘has it got anything on there about plans for any terrorism act?’, asked ‘has it got anything on there that might be construed as causing a public nuisance?’. The correct answer would have been ‘yes’ as I have a word processor, an email client, etc that could all be useful to a terrorist and most likely can be construed to be of use for anything including causing a public nuisance. However, I also realised that answering the positive would not be helpful to me and challenged the question when the investigating officer just wanted answers. 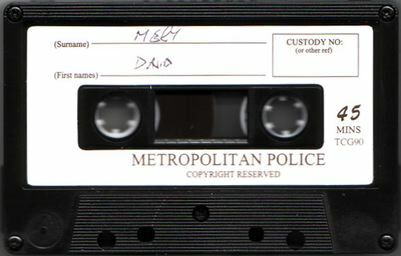 After four years of fighting, including an IPCC supervised investigation, an appeal and threats of civil actions, the MPS Borough Commander for Southwark ‘apologise[d] on behalf of the Metropolitan Police Service for the circumstances that arose on 28 July 2005 including your unlawful arrest, detention and search of your home’. An essential recommendation would be for all front-line police officers to receive some training about the autism spectrum. This training ideally would involve those on the autism spectrum. I understand that a few police officers have had sessions with the Asperger London Area Group (ALAG). This training should be made more generally available. At the very least, front-line officers should read the ACPO-endorsed Autism: a guide for criminal justice professionals publication of the National Autistic Society. With such training it is hoped that police officers realise that a behaviour different from that of a neurotypical is just different rather than suspicious; consider hyper- and hypo-sensitivities that the public they interact with may have; and use clearer interviewing questions. Two inter-related incidents involving service users happened on the night of 2012-10-01 at the River House mental secure unit, part of the Bethlem Royal Hospital run by the South London and Maudsley (SLaM) NHS Foundation Trust. Police were called to both incidents. 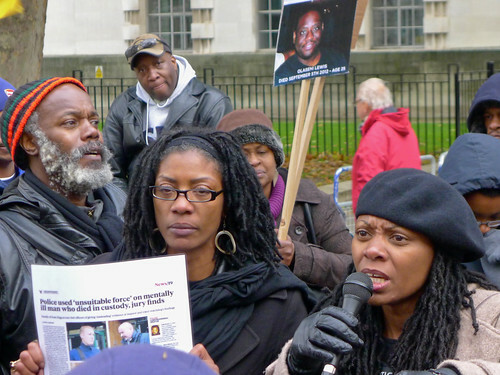 These incidents happened two years after Olaseni Lewis died after being restrained by up to 11 policemen at the Bethlem Royal Hospital and only two months to the day after the Sean Rigg inquest verdict, in which SLaM’s failings were criticised to have ‘more than minimally contributed to the Sean Rigg’s death’. The extent of police involvement was covered up by SLaM and the Metropolitan Police Service (MPS). SLaM delayed publication of its investigation report and initially published a heavily redacted version before I forced it, with the assistance of the Information Commissioner’s Office, to publish the redactions as well. The MPS also delayed their response to my Freedom of Information requests and still claim that the ‘Incident Management Log [their final report] cannot be located’, i.e., was lost. Data obtained from a campaign of Freedom of Information requests to SLaM, the MPS, the Independent Police Complaint Commission (IPCC), the Care Quality Commission (CQC) and Monitor, as well as from ongoing complaints to the Information Commissioner’s Office about breaches of the Freedom of Information Act in SLaM’s and the MPS’s responses, and from letters sent by the MPS to Baroness Jenny Jones has revealed the extent of this cover up: 48 police officers were deployed including six officers from armed response units, two from dog units, 21 PC from the Territorial Support Group (TSG) and the entire Bromley Borough night response team. TSG officers entered the mental health ward and four drew their Tasers. It is unclear whether anyone was physically hurt in these incidents. SLaM stated on 2012-11-08 in its first response to my Freedom of Information requests that luckily this time ‘there were no injuries to patients or staff in this incident’. It reiterated this position to its board of directors: ‘there were no reports of any injuries to staff or patients.’ However the investigation report states: ‘One patient sustained injury to his hand during the second incident. No physical injuries were sustained by staff.’ In any case, having TSG officers drawing their Tasers in a mental health ward can exacerbate or cause mental trauma to vulnerable individuals already suffering from mental health issues. To reassure Londoners that policing of vulnerable individuals with mental health issues is improving, the Metropolitan Police Service and the NHS Foundation Trusts will have to improve on their transparency as well as their performance. Commander Christine Jones, lead on mental health for both the Metropolitan Police Service and the Association of Chief Police Officers (ACPO) is reassuring when saying at the London Assembly’s Police and Crime Committee on 2013-11-21 ‘I have stopped police responding to mental health institutions for the purposes of restraint unless there are very, very good reasons why. […] We have an escalation process in place at the moment for the Metropolitan Police Service which basically means that if a mental health institution calls on police, it goes into my mental health team to assess the circumstances before we respond. It is as simple as that. We have that level of commitment that we are all on call virtually 24 hours a day to make sure that if we have to respond we have the right people doing it and for the right reason.’ However this message has not managed to get through the organisation to the MPS press office which still stated on 2014-01-28 ‘The MPS does not have a specific policy in relation to the deployment of firearms officers to mental health units.’ Again, we have confusion. A policy about all deployment of police to mental health units, preferably based on the words of Commander Christine Jones, should be published. (e) details of injuries caused to patients, staff or any other person. Any investigation report into incidents that required police intervention should also be published in full in a timely manner. Attempting to find out how Mental Health Act (MHA) 1983 s136 is used in London has proved very difficult as there was ‘no central recording system in place that recorded the number of individuals detained under s136 of the Mental Health Act (MHA) by MPS officers for the period [I requested of] January 2012 to December 2012.’ and ‘Form 434’s would need to be searched for and the relevant information retrieved from each of the 32 London boroughs.’ (which is not possible to ask in a Freedom of Information request). The difficulty of obtaining any data on s136 in London is surprising when one finds out that the situation in London is better than in the rest of the country as the MPS has been very good in avoiding to bring individuals detained under s136 to custody suites. Only 59 persons were detained in police custody in the calendar year 2012 whose ‘Arrest Offence [in NSPIS] was set to equal “Mental Health Act” or “S.136 Mental Health Act”’ (when the number of s136 detentions for that year was approximately 2,665). It is however interesting to note that not all boroughs are equally represented: Southwark (12), Lambeth (10), Croydon (7), Newham (5), and Lewisham (4) and Westminster Central (4) top the list of boroughs that use custody suites occasionally to detain individuals under s136. With the exception of Newham, the boroughs were the SLaM NHS Foundation Trust operates are the ones with the highest number of individuals detained under s136 that were brought to a police custody suite and not into the NHS, in 2012. The operation of Section 136 in London suggests that the situation has improved in Newham: ‘If a Section 136 patient arrives at one of these place of safety on an occasion when it is already occupied by a previous patient then arrangements are made to transfer one of the patient’s to a ward. Whilst this is not practical in every case, the evidence clearly shows that performance in 5 out of 6 [including Newham] of these places of safety is considerably better than average.’ I have been in touch with SLaM but have not managed to get any information to explain why numbers were higher in SLaM’s boroughs and/or any remedial step taken. (h) the breakdown of whether those individuals in (a) were considered to be suffering from the effects of drink or drugs (per s136 suite, A&E department and custody suites). (j) the number of individuals detained under s136 of the MHA and admitted to hospital in each borough, following an MHA assessment. The operation of Section 136 in London, An Action Plan to improve was published in March 2013 by the Mental Health Partnership Board for London. This document does not appear to have been made public; a copy was obtained from David Mellish, Chair of the Mental Health Partnership Board for London. Patients treated in mental health units are vulnerable individuals and deploying police officers to handle them is not the kind of care that patients and their families are expecting. It has on occasions resulted in deaths, often of young black men, such as that of Sean Rigg and Olaseni Lewis. So what is the Metropolitan Police Service's policy for such deployment of their officers? Q2: Does the Met have a policy on the deployment of armed police to incidents that take place in mental health units? = The MPS does not have a specific policy in relation to the deployment of firearms officers to mental health units. Firearms officers are deployed to incidents where firearms or weapons are involved. Decisions to deploy firearms officers will include consideration around the type of premises and the persons concerned. The investigation report into the incident at mental secure unit River House includes mentions of some patients 'making threats' but does not make any mention of either 'firearms' or 'weapons' having been in the possession of the patients. Forty-eight police officers were deployed, including armed response units, and four Tasers were drawn. Christine Jones (Commander, Metropolitan Police Service): [...] There is also an appetite to take people down to Grays End to show them the Taser training so that we can have the critical third eye from the lens of the community around when it is used and why it is used. Jenny Jones (Deputy Chair): You have stopped the TSG being sent? Christine Jones (Commander, Metropolitan Police Service): I have stopped police responding to mental health institutions for the purposes of restraint unless there are very, very good reasons why. Claire [Murdoch] and I are busy working through a protocol for London because there are certain areas of London that we get very few calls to and other areas of London that we get lots of calls to. For me, the only time that police should ever go into that health setting, frankly, because you are talking about somebody who is ill, is if there is real danger to life. That is a different issue. Jenny Jones (Deputy Chair): It is bad for the police as well, of course. Christine Jones (Commander, Metropolitan Police Service): Of course it is bad for the police, but imagine what it is like for the person. I cannot think of anything more terrifying. We have an escalation process in place at the moment for the Metropolitan Police Service which basically means that if a mental health institution calls on police, it goes into my mental health team to assess the circumstances before we respond. It is as simple as that. We have that level of commitment that we are all on call virtually 24 hours a day to make sure that if we have to respond we have the right people doing it and for the right reason. Christine Jones (Commander, Metropolitan Police Service): Hugely. Absolutely massively. Q3. Do you recognise the concerns from campaigners about the use of armed police in mental health incidents? = The MPS takes onboard concerns raised around the use of armed officers to mental health incidents and always places the safety of the public paramount. Met firearms officers attend special training days where they work with mental health workers and patients to assist them in understanding and responding to people who suffer from mental health issues. We have introduced information sharing protocols to obtain fast time intelligence about any person who may be considered EMD (Emotionally or Mentally Distressed) or suffering behavioural disorders. Training around mental health issues is also included as part of officers on going training as well as forming part of the NPFTC (National Police Firearms Training Curriculum) instruction courses for firearms officers. In September 2012, the Commissioner requested an independent commission to look at the MPS response to mental health. It was also asked to examine the interface between the MPS, mental health services and other partners. Since the report by Lord Adebowale was published in May 2013, the MPS has fundamentally looked again at how we work as an organisation, and with partner agencies, to improve services, share information and better understand the needs of people with mental ill health with the aim of delivering a service that can be best adapted to fit individual needs. The 28 Recommendations within the Independent Commission report on Mental Health and Policing (2013) are being progressed and embedded in the direction of travel for policing, both locally and nationally. We continue to work locally across London and nationally with partners across the health spectrum and we have also contributed to the forthcoming Department of Health Crisis Care Concordat [(pdf)]. This is where a number of national organisations have committed to work together to support local systems to achieve systematic and continuous improvements for crisis care for people with Mental Health issues. The MPS are also in the process of rolling out the Community Risk MARAC group (Multi Agency Risk Assessment Conference) and a pilot is currently underway in all NW London Boroughs. This is a local partnership forum, where high risk and developing cases can be discussed and problem solved. The MPS are also in the process of training all front line officers in the Vulnerability Assessment Framework (VAF). The VAF is a simple investigative approach to assessing vulnerability, in all interactions the police have with the public. The MPS is committed to delivering a quality of service and care for all those who come into contact with the MPS - especially those who are at their most vulnerable through mental ill health or crisis. Absolutely, and that is the point, I do not think we have invested enough in teaching our officers to understand vulnerability. What we have said is, “You need to be trained in this, you need to be trained in this, you need to understand this risk assessment, you need to know ...” No, actually, our officers need to know this, that is the primary issue for us, we need to understand the legal framework in which we operate and then the issue is how we understand the vulnerabilities and diverse needs of our communities and that is my issue. I do not think we have trained our officers effectively in recognising vulnerability. We have done lots and lots around race, we have done lots and lots around professionalising investigation, but actually the human piece around this is how we deal with people on a daily basis, how we recognise their different needs by understanding where they may be vulnerable, and to be perfectly honest the feedback that we have had from the communities in London around satisfaction has regularly told us, “The officer failed to recognise my vulnerability”. We have the evidence there; we are now using it to fundamentally change that frontline training and, as I say, every single officer in London will have had that training by the end of next year and every single encounter we have with a member of the public they must apply that framework. Christine Jones (Commander, Metropolitan Police Service): I absolutely reflect that unhappiness. When you have disparate systems, disparate information technology (IT) and technology that does not talk to itself, you are immediately into a difficult arena. Until I took over the lead for mental health back in September last year, we had no way of knowing by pressing a button how many people across London we had encountered with vulnerability leading to mental health issues. We had no way of looking up how many Section 136 interventions we had or Section 135. We changed that in January this year and in April that rolled out across the Metropolitan Police Service, so we now use the Merlin system to highlight vulnerable adults coming to notice. [...] Good metrics now under Section 136. We have good metrics now. Some changes have happened while others are going through the organisation. At the Police and Crime Committee, Commander Christine Jones said she 'took over the lead for mental health back in September last year', i.e., September 2012, a month at most before the deployment of 48 police officers at River House. Police involvement at this incident was covered up by the South London and Maudsley (SLaM) NHS Foundation Trust and the Metropolitan Police Service. I have two complaints currently with the Information Commissioner's Office, one for each of these organisations about how they are still attempting to avoid publication of information related to this incident. To reassure Londoners that policing of vulnerable individuals with mental health issues is improving, the Metropolitan Police Service will have to improve on their transparency as well as their performance. Home Office statistics show that the use of Tasers keeps increasing, by 27% in 2013 compared to 2012. Police officers in England and Wales equipped with Tasers used them 10,380 times in 2013. More police officers are responsible for this increase. The article Tasers: the 'non-lethal' weapon reckoned to have caused more than 500 deaths, published in November 2013 on The Justice Gap, explains that, '[i]nitially only Authorised Firearm Officers (AFO) were equipped with Tasers, however 'Currently there are 14,700 officer trained to use Tasers [but the] number of AFOs is 6,979.' The Justice Gap has also published a video of a Taser refresher course with the London Metropolitan Police in 'Shocking Britain': the controversial roll-out of the Taser. The initial trial of Taser concluded on the 31st March 2004. In July 2007 the Home Secretary approved a year long trial of 10 forces to extend the use to "specially trained units" (STUs). The MPS was one of these forces. Its use was initially restricted to SCO20 (TSG) officers. In February 2012 Management Board supported the extension of Taser to other STUs including those on Boroughs. All 32 London boroughs now have a group of officers on their borough who are trained in the use of Taser. [...] Around forty officers from each borough have been trained in the use of Taser. The initial training is now complete. Taser trained officers are deployed in pairs in two cars on each borough, that's a maximum of 4 officers per 8 hour shift over a 24 hour period. Even more officers may eventually get a Taser as '[i]n November 2011, Commissioner Hogan-Howe said that all officers should have easy availability of Taser.' (interview with LBC radio as reported in Governance of Taser and other less-lethal weaponry). And as a report published earlier this week by the Independent Police Complaint Commission shows, some of these officers make mistakes with terrible consequences such as firing a Taser on a 63-year old blind man with a white stick when looking for someone in his mid-twenties with a sword. Highest use Fired 17% The taser is fired with a live cartridge installed. When the trigger is pulled, the probes are fired towards the subject with the intention of completing an electrical circuit and delivering an incapacitating effect. The officer fires the weapon with a live cartridge installed. One or both probes may attach to the subject The officer then holds the taser against the subject's body in a different area to the probe(s), in order to complete the electrical circuit and deliver an incapacitating effect. Drive stun 3% The taser is held against the subject's body and the trigger is pulled with no probes being fired. Contact with the subject completes the electrical circuit which causes pain but does not deliver an incapacitating effect. Non-discharges Red dot 51% The weapon is not fired. Instead, the taser is deliberately aimed and then partially activated so that a laser red dot is placed onto the subject. Arcing 1% Sparking of the taser without aiming it or firing it. Aimed 5% Deliberate aiming of the taser at a targeted subject. Lowest use Drawn 22% Drawing of taser in circumstances where any person could reasonably perceive the action to be a use of force. Even though information about Taser use is held, it does not follow that police forces are forthcoming about how Tasers were used at specific incidents. In my Freedom of Information requests to the MPS about the River House incident, no such data was provided. This is subject to an internal review. Two inter-related incidents involving service users happened on the night of 2012-10-01 at the River House (RH) mental secure unit, part of the Bethlem Royal Hospital run by the South London and Maudsley (SLaM) NHS Foundation Trust. Police were called for both incidents and SLaM has attempted to cover this up. A news story the next day did reveal that Territorial Support Group (TSG) officers were called, but not how many and whether any other specialist units had also been deployed. A few days later a whistle blower and two external third party individuals alerted the Care Quality Commission. When queried about these incidents, SLaM admitted that 'police had been called' without elaborating any further. 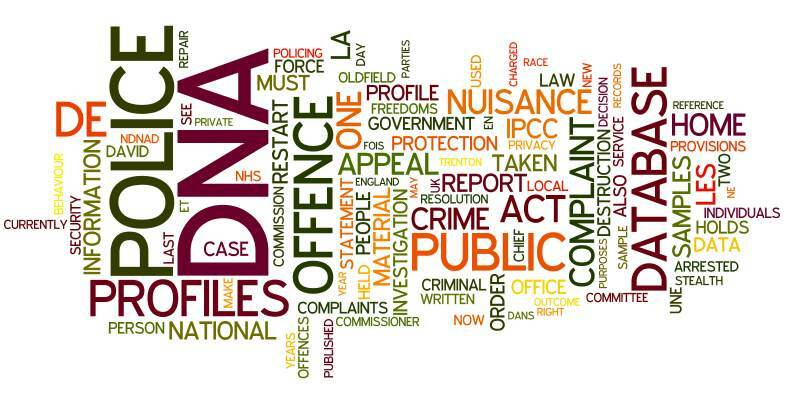 Data obtained from a campaign of freedom of information (FoI) requests to SLaM, the Metropolitan Police Service (MPS), the Independent Police Complaint Commission (IPCC), the Care Quality Commission (CQC) and Monitor, and an ongoing complaint to the Information Commissioner's Office about the breaches of the Freedom of Information Act in SLaM's responses has revealed the extent of this cover up: 48 police officers were deployed including six officers from armed response units, two from dog units, 21 PC from the TSG and the entire Bromley Borough Night Response team. The TSG, armed and dog units officers are all trained to use Tasers. Further information shows that TSG officers entered the mental health ward and four drew their Tasers. They were called that night to manage a situation involving vulnerable individuals suffering from mental health issues. Following a complaint to the Information Commissioner's Office, on 2014-02-28, SLaM sent in another version of its report with some text previously redacted now included and what remains redacted shown as blacked out text (pdf). As of this writing this less redacted report has still not replaced the first version on SLaM's website. The following details the shocking information that we have uncovered. This is the report of an Independent investigation commissioned by South London and Maudsley NHS Foundation Trust, following two separate but related patient incidents on the night of 1st October 2012, involving Norbury patients on Spring Ward. [...] The first incident began at approximately 2200, when one patient, as part of his recurrent delusional state, accused the designated ward-based security nurse on the night shift of stealing designer wear and trainers which he believed his mother had brought to RH for him. Attempts to deescalate this incident were unsuccessful. Although a decision was taken to offer the patient prn medication, a second patient destabilised the intervention and two other patients subsequently became involved. Staff considered the situation to be unsafe and retreated to the nursing station. Assistance from the Metropolitan Police was first requested at 2244 and the first police officer from Bromley Police Station arrived promptly at 2247. The police contend that on arrival they were unable to access key information about the patients involved in the first disturbance which frustrated their ability to risk assess the situation. [...] With the assistance of the Metropolitan Police and the first on-call CAG manager, three of the four patients were, after several hours, placed in supervised confinement (SC) on other wards. The clinical environment was restored at approximately 0230. In the second incident which occurred at approximately 0250, one patient challenged staff with regard to decisions which had been taken about the management of the four patients involved in the first incident. He accused them of discrimination, believing that there had been a racist motive and that staff had assisted the police to pursue this line of action. He threatened to kill staff and one of the white perpetrators, who he declared had been treated differently to the black perpetrators. This resulted in nursing staff losing control of the ward for a second time when they retreated to the nursing station. This [second] incident also required intervention from on-call managers and the Metropolitan Police. The clinical environment was finally restored at 0500. Officers from Bromley police and the territorial support group dealt with the situation and left the scene at around 2.50am. And three fire engines were sent to the scene at about 12.30am after receiving reports of a fire alarm going off but there was no fire. There were no arrests or reports of any injuries to staff or patients. This is a very serious matter, clearly the ward team lost control of the care of their patients and the situation may well have been much more serious than it has been. I noted the trust have provide a 'fact finding' report and commissioned an independent investigation. - Overall concerns raised for the safety of detained patients, in particular those from ethnic minorities - especially in light of the Sean Rigg Case in 2010. - Allegations that the trust was covering up details of the incident on 1 Oct, especially in relation to police involvement. [...] This letter is to request that the CQC conduct an independent investigation into the matter and SLAM's treatment of its patients, particularly those from ethnic minority communities as a matter of urgency. The recent high profile fatalities of black men in the care of SLAM make this latest incident of particular concern. The Sean Rigg inquest verdict concluded that SLAM's negligence had more than minimally contributed to his death. Rigg died in 2008 and SLAM made public statements that improvements have been made in the treatment (particularly of black patients detained in their care). However, in 2010, -------------- [the name of Olaseni Lewis is redacted in the copy of this letter disclosed by the CQC] died after he was restrained by 14 police officers for 45 minutes while on a secure ward run by SLAM. After police release ---- [Lewis] and he was lying in a semi conscious state on the floor of a seclusion room, SLAM staff then injected him with antipsychotic medication. The inquest into the death of --------- [Seni Lewis] will being in March 2013 [this inquest has since been delayed]. I think it is important for the CQC to be aware of the recent history of this trust as it is in light of this that I am writing to you as the health regulator about the riot that occurred on wards run by SLAM on the evening of Monday 1 October 2012. I have been made aware that the over use of force and high doses of antipsychotics and tranquillisers dominates the way patients are treated in secure wards run by this Trust. The oppressive culture of this health provider may have been a factor behind the riot at the Bethlam [sic] which is run by SLAM on Monday 1 October. This letter is also to request that you contact the chief executive of SLAM regarding the issues that have been raised in this letter and also for the CQC to conduct an independent investigation into this incident. The particular concerns about the incident, which I would like the CQC to investigate include: establishing level of police involvement. It would be helpful to establish how many patients were restrained or subject to force by the police during this incident. I would also like the CQC to find out if Tasers, CS spray, Alsatian attack dogs, batons, hand cuffs or riot gear was used during this incident and also the levels and number of psychical injuries sustained by patients. [...] A serious incident had occurred the previous week at the Bethlem involving two patients at SLaM taking other patients and staff hostage. The police had been called for support but the incident had been managed well by staff at SLaM and the police did not get involved in the incident. This demonstrated that improvements had already been made to the way in which the Police and SLaM were working together and the team which was called in to deal with such situations were adequately trained. · That the principles of openness and transparency should be endorsed by health trusts. It is healthy for the health overview and scrutiny committee to be informed of instances such as occurred on 1 October 2012 and all should work towards a protocol on sharing information. Gus Heafield reported that there was an incident involving patients at River House at Bethlem Royal Hospital on the evening of 1st October 2012. Staff responded promptly and professionally and called the police who attended the scene with fire crews. The incident was contained within the unit and there were no reports of any injuries to staff or patients. An external investigation will be carried out and it was noted that the three members of the independent panel had been appointed and terms of reference for the review had been agreed. The review was due to be completed in January 2013. The Care Quality Commission had been notified of the incident and has been kept informed about the independent review. This [first incident] necessitated intervention from the RH Rapid Response team, The Bethlem Royal Hospital (BRH) Emergency Team, various on-call managers from the Behavioural and Developmental Psychiatry (BDP) Clinical Academic Group (CAG), an On-Call Executive Director, the Metropolitan Police, the London Ambulance Service, and the presence of the London Fire Brigade. 10 Police Constables from the response team at Bromley. The Inspector declared the incident "otherwise so dangerous" and requested Commissioners Reserve. [...] In the course of approximately three and a half hours, somewhere in the region of forty police officers were on-site, ______________________________________________ the Territorial Support Group (TSS) [sic] – Commissioner’s reserve, three police dog units and Trojan (specially trained armed officers). [...] The Lock Down policy stipulates that for a major incident the Bronze, Silver and Gold command structure should be established. In the course of approximately three and a half hours, somewhere in the region of forty police officers were on-site, comprising the entire Bromley Borough Night Response team, the Territorial Support Group (TSS) [sic] – Commissioner’s reserve, three police dog units and Trojan (specially trained armed officers). The police adopted this modus operandus, but despite the fact that several managers became involved throughout the night, four of whom came on-site at various times, there is no evidence that the Bronze, Silver or Gold command roles were assigned to Trust staff to work with the police accordingly. Armed police officers, dog units and riot police officers have no place on a mental health ward. Having a situation deteriorates to the point that SLaM and the MPS decided it needed such a high police response brings serious concerns as to the safety of the vulnerable service users being treated. We know that the Metropolitan Police Service classified these incidents as critical and that they established a Bronze, Silver and Gold command structure. However we do not (yet) know from which units officers forming this command structure came from, and we do not know if any weapon, whether guns, Tasers, batons or CS sprays were drawn and / or used, or whether any dog was released. London Assembly member Baroness Jenny Jones has written to Sir Bernard Hogan Howe, Metropolitan Police Service Commissioner, Sarah Green, ICC Deputy Chair and Norman Lamb, Minister of State for Care Support to raise her concerns and ask for this information. The records held include ten CAD reports [Computer-Aided Dispatch] and one CRIMINT report [Criminal Intelligence database]. The CADs relate to the 999 call and subsequent dispatch of officers, the CRIMINT is an intelligence report. I have been informed that on Incident Management Log was created however despite searches on borough and with the senior investigating officer I have not been able to locate this document. I am writing to advise you that, following a search of our paper and electronic records, I have established that the information you requested is not held by the IPCC. This is because the IPCC was not involved in this incident. the patient's [sic] involved in the incident were placed under enhanced levels of care: -- [redacted] transferred to ------- Clinic, -- transferred to HMP -------, -- transferred to HMP -------, -- transferred to ------- ward and -- remains on ------- Ward. Between 2012-01-01 and 2012-10-19, 196 violent incidents at River House were reported to the National Patient Safety Agency. Of these 101 were within the Bromley Local Authority and 95 in Lambeth. It is not known whether the police was called to any of the other violent incidents reported. As safety of patients and staff is paramount, SLaM must become more transparent into the way it operates. As you know, the Trust has previously withheld some aspects of the Report from disclosure by applying the exemptions in sections 38 (health and safety) and 40 (personal data) of the Freedom of Information Act (2000). Following your complaint, the Information Commissioner’s Office has undertaken an independent assessment. The Trust has now resolved to withdraw its use of the exemptions in sections 38 and 40 of the Freedom of Information Act (2000) to the Report and to disclose it in an un-redacted form. The version of the investigation report just sent in with the blacked out text now visible is available here (pdf). To identify more readily the new information, I had recreated the document highlighting the differences but had not released it until now in case the Information Commissioner's Office (ICO) ruled some exemptions were justified; you can check it here (pdf). There remains one unaddressed issue in my complaint to the ICO, the investigation report mentions, on page 10, 'section 17 of this Independent report' however there are only three sections in the published report. Also mentioned, on page 2, is that the 'report refers to ten patients, whom for the purposes of confidentiality have been anonymised (referred to as patients A to J)', however only patients A to B are referred to. These are either typos or there are further missing sections. [...] The Commissioner’s reserve of TSG [Territorial Support Group] was deployed to resolve this incident and when they arrived they effectively took over from the ARV's [Armed Response Vehicle units]. I would stress that they [sic] ARV's never left the rendezvous point. As you may be aware the Commissioners reserve operate as a single unit of 1 Inspector, 3 Sergeants and 21 PCs. This of course would contribute to the seemingly large number of officers on scene at the incident. However, only officers from the TSG entered the ward and although 4 officers had their Taser drawn, through effective use verbal commands they safely resolved the situation without any further use of force. I can also confirm that the Dog support units did not deploy on to the ward. [...] I am sorry that you have heard that this incident has damaged the confidence of black Londoners in relation to policing and mental health. This scale of incident is quite rare, in fact the MPS has reduced the number of calls that it attends at health based places of safety by 70%, but I remain concerned that police officers are being asked to carry out restraint in mental health facilities. To try to resolve this, protocols between health service managers and police Duty Officers are currently being developed. [...] Unfortunately there is no current time frame for this work to be completed. This does not state whether TSG officers did restrain any patient that night, and if so how many (the investigation report describes that police assisted in placing three patients in supervised confinement). Also AC Mark Rowley figure of 70% reduction of police calls is meaningless as no period is given, nor a basis or a target for this reduction (and the definition of 'health based places of safety' is open to interpretation). SLaM has published the list of actions it has taken as a response to the recommendations of section 3 of the investigation report in this pdf. First published on 2014-03-20; last updated on 2014-05-05 (added mention of SLaM unredacting the blacked out text in the investigation report, the letter of AC Mark Rowley to Jenny Jones, the publication of the response to the recommendations and minor other corrections).